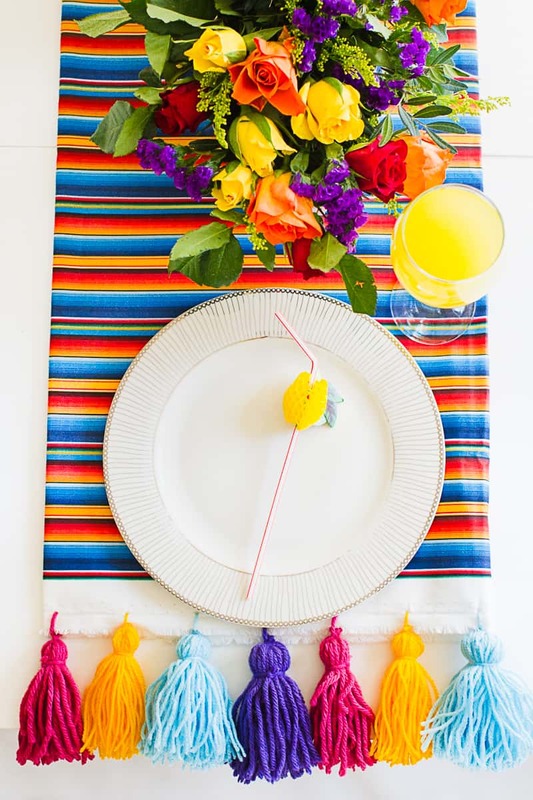 Today’s guest post features our new favorite bright table runner, courtesy of a DIY tutorial from our lovely friends at Bespoke Bride. Emily and Jessica’s blog helps readers find inspiration not only for weddings, but all decor projects, ranging from colorful to creative. 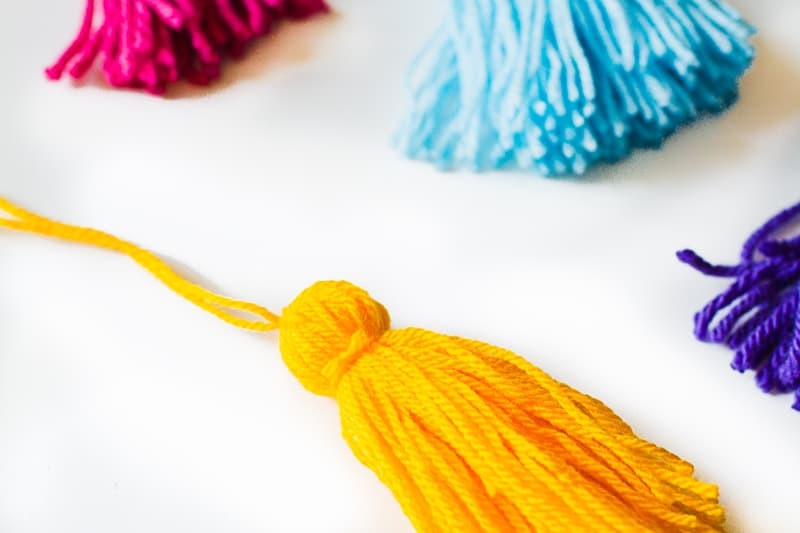 Tassels aren’t just for new grads, but for this snazzy table runner, too! 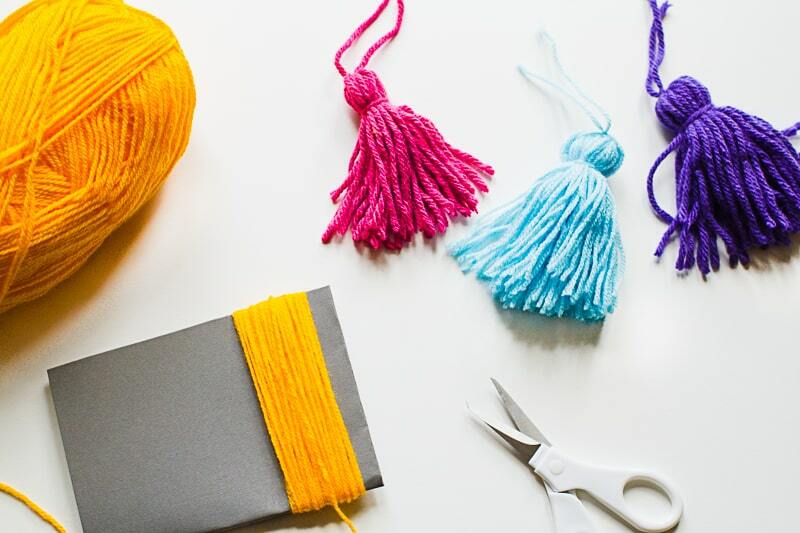 This no-sew tutorial is simple and perfect for those getting started in DIY projects. Let’s get started! 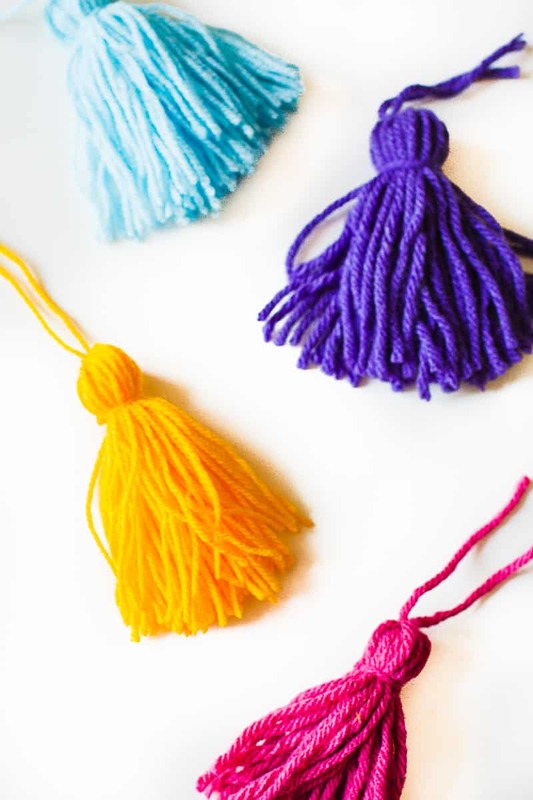 I have to admit I have a little bit of an obsession with tassels at the minute. I want to put them on everything and I even made a few cat toys with them the other day. Too much? Nada! 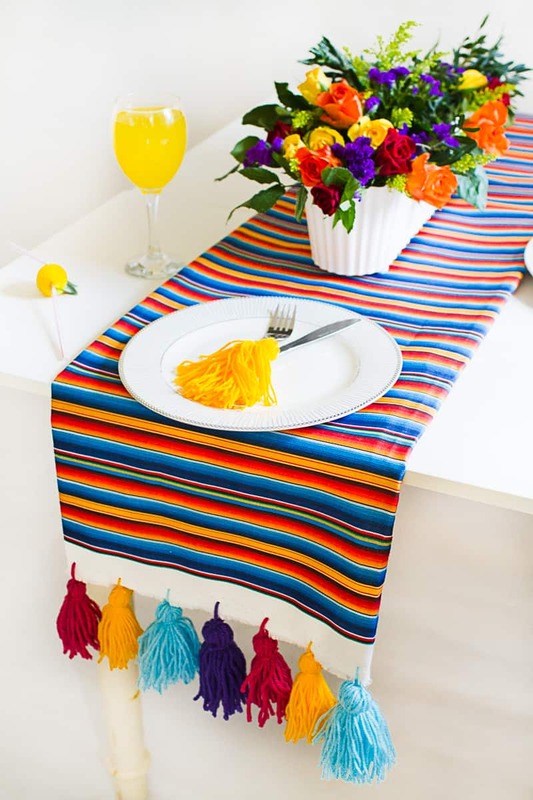 – Sparked by my tassel craze and this absolutely stunning Mexican inspired material provided by Zazzle, I made my own table runner. 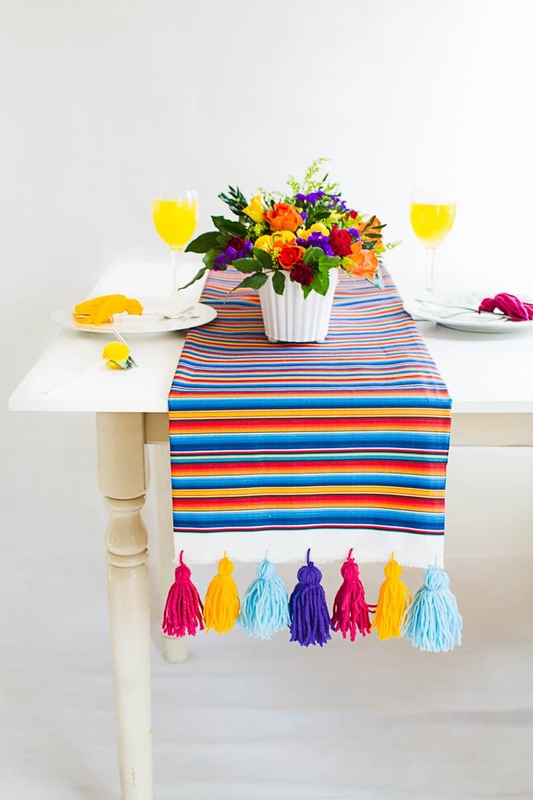 I love how it fits so perfectly with this months fiesta theme and I am so excited to get my hands on more Zazzle fabrics soon, their custom collection is the bomb! I have soooo many favourites but right now but my current faves are this Girly Kitten print, these pink flamingoes and this colour block fabric! Seriously guys have a mooch around over there, it is a haven for wedding supplies as well as craft. Step 1: Continuously wrap your wool around your cardboard, until you have a thick bundle and cut off at the last strand. 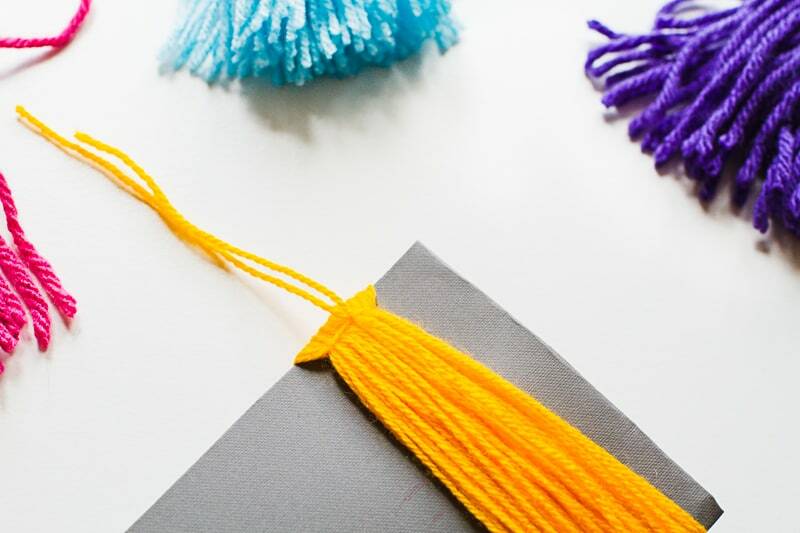 Remember the thicker the bundle the fuller your tassel will be. Step 2: Cut another piece of wool, around 10cm. Thread this under the wool at one end and tie tightly. 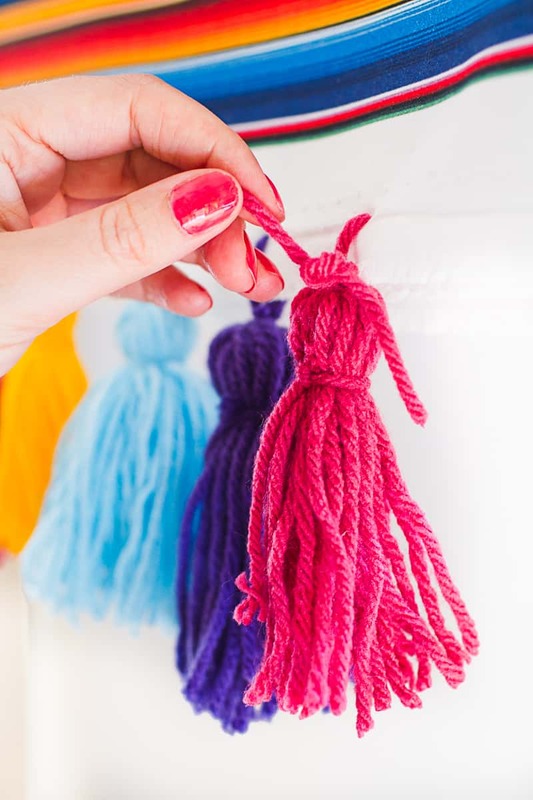 This will hold your tassel together. Step 3: Cut along the length of the tassel at the other end to remove it from the cardboard. Step 4: Now cut another piece of wool, again around 10 cm, wrap this around the top of the tassel and tie tightly. 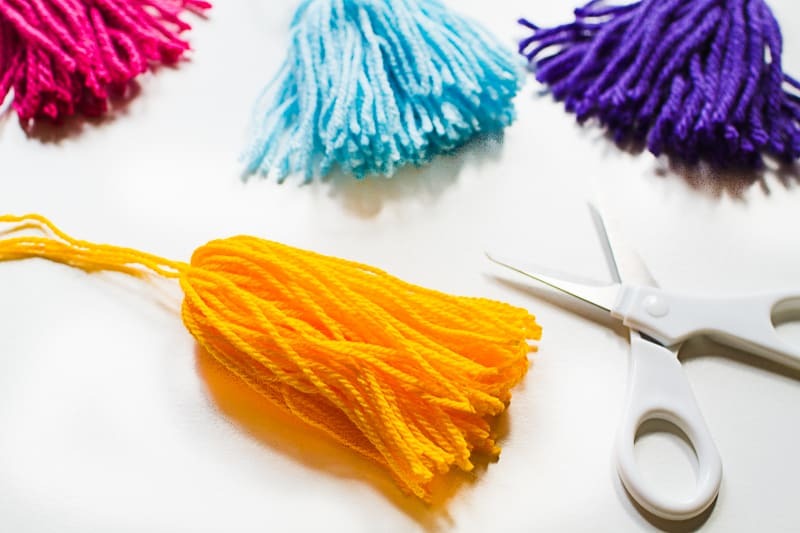 Step 5: If you need to, trim the ends of tassel to tidy it up. Step 6: Continue this with your range of colours, until you have as many as your need. Step 7: To attach these to our table runner we made some small holes at the bottom of each side and threaded our tassels through, securing them tightly. Easy peasy for those of you who don’t own a sewing machine. Didn’t I tell you that was simple, not a single bit of sewing or gluing needed! 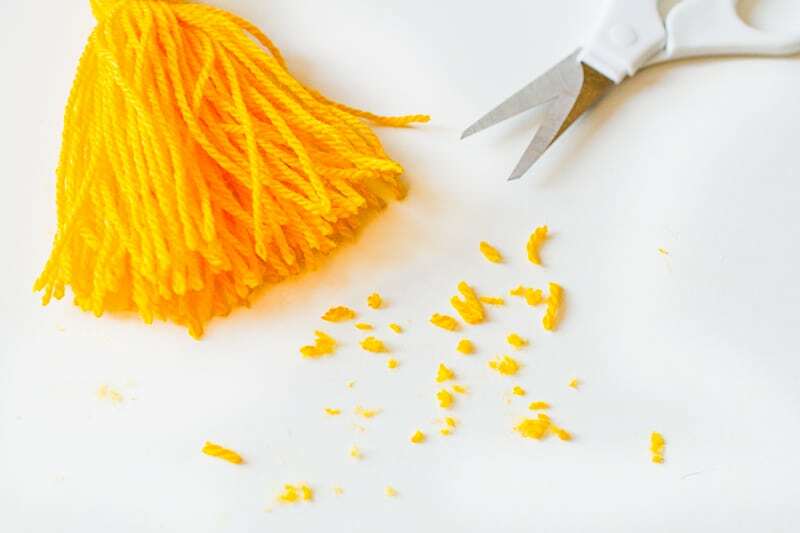 You don’t need to use wool yarn, any cotton, acrylic or mixed blend works. Wool can be very hard (and expensive) to find especially in bright summer colors. A lot of stores are selling little 1.5 oz for around $1, since you might only need very little if using multiple colors.